Its that time again and this Month's theme CAS (Clean and Simple)for the Blog hop was chosen by Lori and she is the very start of our Hop. We will hold this every third Thursday of the month , we aim to give you a little inspiration and hopefully a few Oooo's and Awe's along the way. The Dream Team is made up with some of the most talented ladies so be sure to give them all a visit. 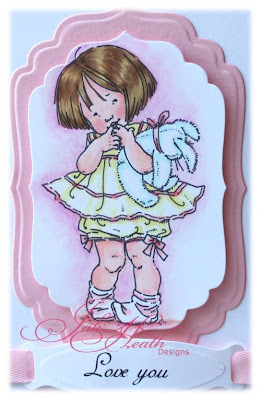 Shy was coloured with Copic markers then cut out using the Nestabilities label die. Little pearls added to the center of the punched out flowers. Be sure to pop over to Liza next I just know she will have something amazing to show you. If you get lost along the way I have a full list of the Design Team on my side bar. A fabulous card Jak, just perfect for this month's theme. This is so sweet and that MS punch just finishes it off I spotted it yesterday in my local craft shop one to save up for I think. Love it Jak! So simple, so sweet - gorgeous use of the Nesties and the punch - simply adorable. This is stunning Jak. I love it so much. Love the colours and your image has been coloured beautifully. Very much the WOW factor. Oh Jak, she's adorable and so is your card. Love how you have set it out and fab colour choice. Such a pretty card, Jak. Love the lace on the bottom edge. Adorable. Clean and simple but oh so beautiful Jak!! She's gorgeous Jak, a beautiful card! 'Simply' beautiful, Jak. Your colouring and matting are fab. Simply awespme Jak hun xxxx I LOVE it!! Paperlace make the big differens. So cute card! I have all those punches and ides except for the one with "love you on it".. Is that a nestabilities die? Would like to know! I love the soft hand with Shy's yellow frock. Adorable. Oh, how sweet. Great job. TFS. I love the punch with the eyelet look and ribbon that ties in so well with the sweet image. Your card is just precious. Thank you for giving us some CAS inspiration!! Great card!! Beautiful card Jak! Great inspiration. I love everything about this card. You did a beautiful job!!! Thank you for some great inspiration. Oh, so sweet-love the softness of this card. Perfect for a shy little kiddle! I love the punch - haven't seen it before. Is it a MS? All your cards are elegant!!! Wow! I love these cards. Well done! Just beautiful. Love the sketch you used, how you layered the nesties, and your choice of colors. So cute! This is so lovely! I love the simplicity of the card it really shows off the adorable image.